Hello gang. It’s baby day at the Kiddo, where we take a gander at all things teensy. Today we have a super cute nursery that I’ve been dying to show off. Now, I’m a big believer that color is always awesome. 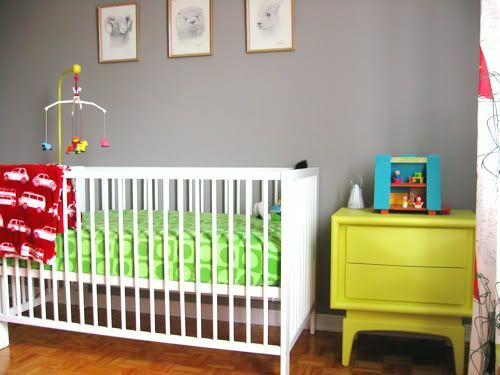 That baby boys and girls can survive without living in a pale blue or blush pink world. Don’t get me wrong, I think pastels can be extremely elegant and lovely. 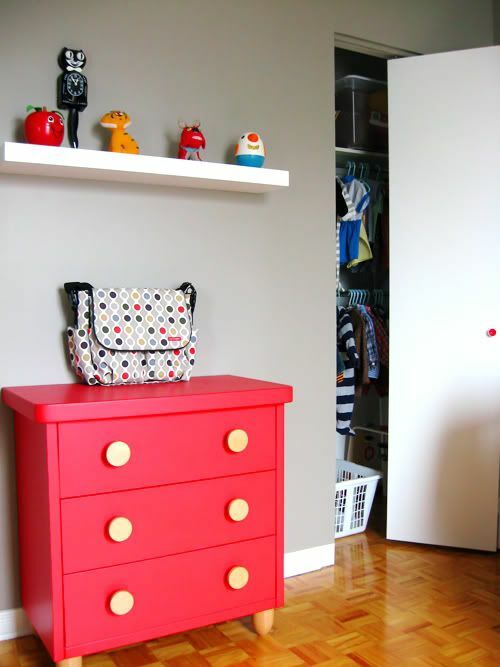 But how much more fun to be totally unexpected with your nursery? 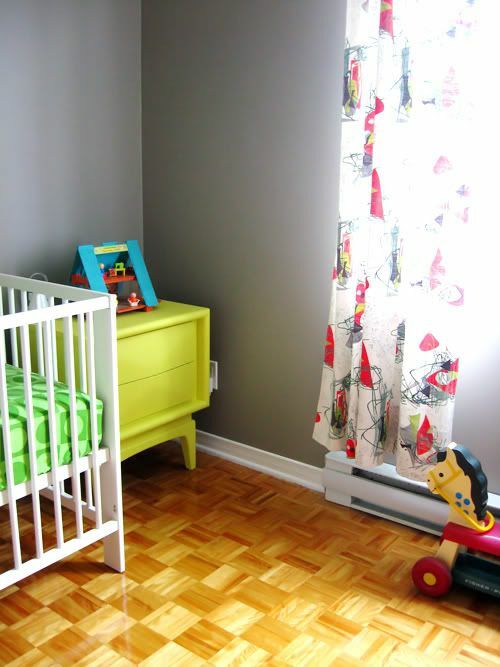 Like, what would you say if I told you to consider painting your nursery walls GREY? 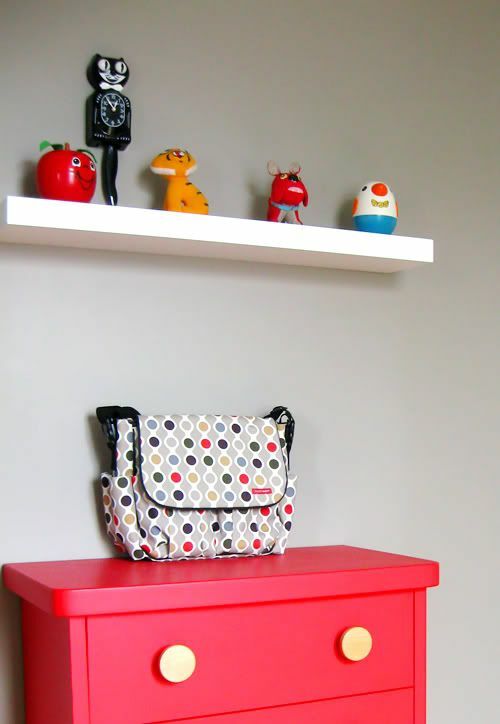 Well don’t answer that until you see this lovely space my friend Virginie in Montreal has created for her wee one. It’s quite the stunner! I love love love it! The grey is unexpectedly soothing and serene, but then the pops of green and red make it really fun and playful. 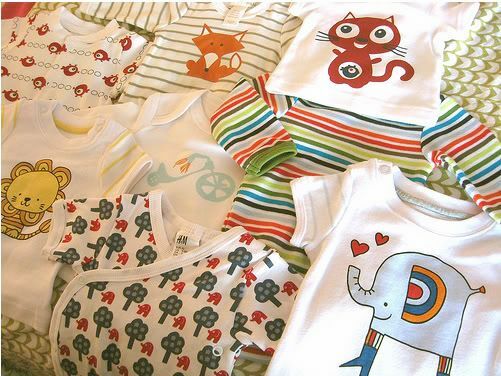 Virginie is so creative and cool—her little man-on-the-way is going to be a lucky boy for sure! The sheets were remixed from a pair of vintage 70s fitted “grown up” sheets (so crafty!). 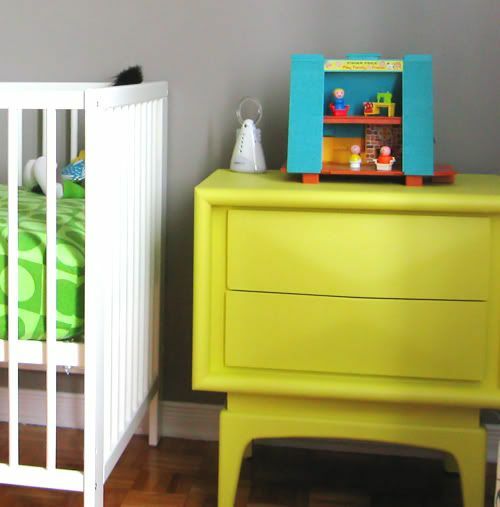 The crib is the simple, sleek (and affordable!) Gulliver from IKEA. That mobile? Yup. It’s vintage—and its Fisher Price. (You know we give that the thumbs up!) The wall are are framed animal prints by J. Sharkey Thomas, from 1973. I think you’ll recognize some more Fisher Price on the shelf above the dresser! 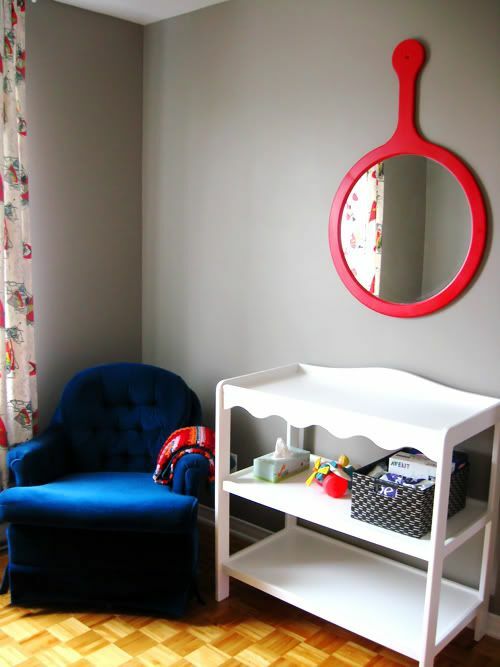 That blue velvety chair is vintage and the big mirror is IKEA! You can see a peek of some vintage curtains on the left. Virginie thank you so much for sharing this gorgeous room with us. We can’t wait to welcome your little kiddo into this big ol’ world! PS Oh and the walls? The color is a luscious warm grey called Ashley Grey, by Benjamin Moore. Posted in Kiddo Rooms, Widdle Wednesdays. Oh man. I love every single thing about this nursery. Makes me wish I had another kiddo so I could replicate the whole thing! Lovin the grey and of course anything with lime green makes my heart sing. PERFECT! This room is exactly the essence I want to create for my baby’s room! I have a little wood dresser similar to the green one that I’ve been meaning to paint. Now I can’t wait! Awesome!! I’m so glad you like this room too. She did such a fabulous job….Martina if you so something like this, you must promise to send us pix!! wow, what an elegant yet playful room! i would NEVER choose grey and yet here it is looking amazing. and i really love the interesting mix of furniture. very cool! 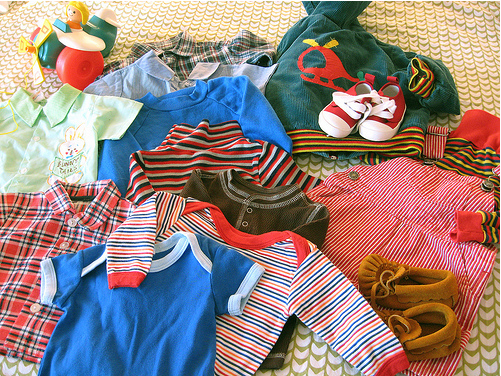 i am loving that vintage clothing stash!!!! 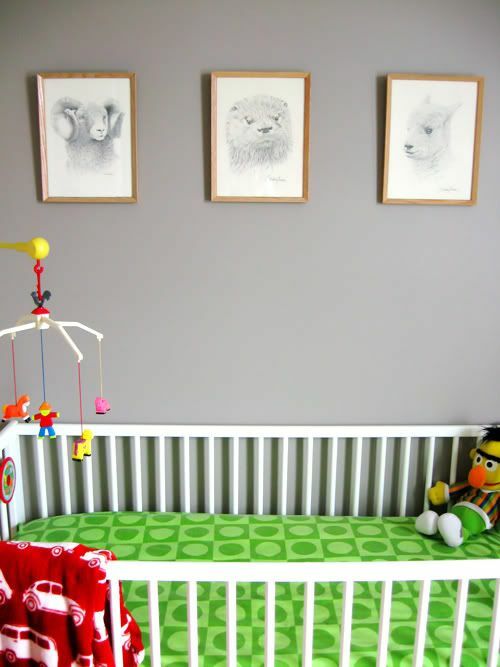 This is one of my favorite modern nurseries I’ve ever spotted online! Aw snap! We had that FB mobile. I’d never forget that little rooster. So awesome. 🙂 this is the BEST kids room ever! So calming! She did such a wonderful job! ps now I want a grey room!